During a bitter siege between Rome and the Etruscan city of Veii, three women follow very different paths to survive. Caecilia, Roman born but Etruscan wed, forsakes Rome to return to her Etruscan husband, Vel Mastarna, exposing herself to the enmity of his people while knowing the Romans will give her a traitor’s death if Veii falls. Semni, a reckless Etruscan servant in the House of Mastarna, embroils herself in schemes that threaten Caecilia’s son and Semni’s own chance for love. Pinna, a destitute Roman prostitute, uses coercion to gain the attention of Rome’s greatest general at the risk of betraying Caecilia’s cousin. Each woman struggles to protect herself and those whom she loves in a dark cycle of war. What must they do to challenge Fate? And will they ever live in peace again? 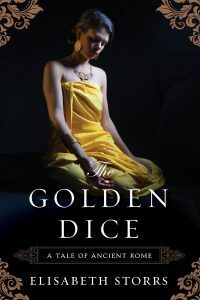 The Golden Dice was judged runner-up in the 2013 Sharp Writ Book Awards in general fiction and was also judged first in category for Ancient Fiction in the 2014 Chaucer Awards. It is the second book in the Tales of Ancient Rome Saga, which includes The Wedding Shroud and Call to Juno. Don’t own a Kindle? - Download the free Kindle App here.